Go to our research guide on primary sources, for an explanation of these types of sources and a more comprehensive look at the Library's primary source collection, both in print and online. The Legal Classics library offers more than 2,400 works from some of the greatest legal minds in history, including Joseph Story, Jeremy Bentham, William Blackstone, William Holdsworth, Henry Maine, Frederick William Maitland, Frederick Pollock, Louis Brandeis, Benjamin N. Cardozo, Edwardo Coke and many more! In addition to many "classics", this collection includes rare items that are found in only a handful of libraries around the world. The collection focuses on constitutional law, comparative law, political science, and other classic topics. Browse the collection by title, author, subject, or date. 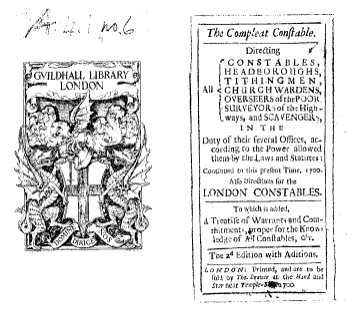 Early English Books Online (EEBO): contains page images of virtually every work printed in England, Ireland, Scotland, Wales and British North America and works in English printed elsewhere from 1473 to 1700. Eighteenth Century Collections Online (ECCO): A digital archive of 150,000 books published in the eighteenth century, covering a broad spectrum of topics like law, history, science, and art. EEBO and ECCO can be searched together. If you wish to do so, when you are on the advanced search screen of either, choose the option to include documents from ECCO or EEBO. The Making of the Modern World: Provides the full text of over 62,000 works, including books and other monographs, on business, politics, and economics published from 1450 to 1850. Includes the full Goldsmiths’-Kress Library of Economic Literature.